Classic DnB-esque flanging. Beautifully easy to use. Suitable for live or studio use. Chaos function for experimentation. Super-clear layout. Highly versatile. 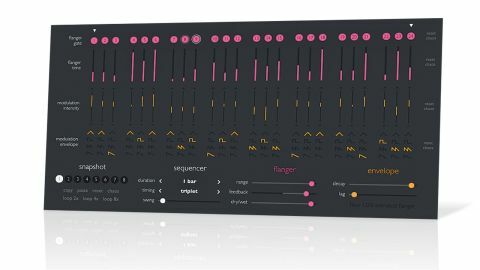 Its latest Mac-only Audio Units plugin is a flanger controlled by a sequencer offering 1-32 steps (1-24 when set to triplets), at a range of step lengths from 1/32 to 1/1. The sequence cycles over 1-32 bars and Swing is on hand for applying shuffle. Each step hosts controls for Flanger Gate, Flanger Time, Modulation Intensity and Modulation Envelope. "Whether used with the step sequencer or 'freestanding', Flow delivers stunning digital flanging"
The Flanger Gate buttons are effectively per-step bypass toggles for the flanger, and can be used to create choppy gated patterns - when the effect is 100% Wet, the Flanger Gate acts like a regular audio gate at full attenuation, since there's no dry signal to let through. Flanger Time is a relative control, offsetting the global Range slider (the time delay between the two signals), which can be set from 0.5-20ms, enabling the full array of distinctive flange effects - being able to set individual Time settings for each step allows for intricately rhythmic variations. Next comes the bipolar Feedback control, a global setting for emphasising odd or even harmonics, dramatically altering the sound characteristics. The Modulation Envelope buttons and Intensity slider govern the modulation of the Flanger Time control for each step, the first establishing the strength and direction (up/down) of the modulation, the second offering four envelope shapes. The global Decay and Lag sliders adjust the envelope's length and smooth out the sound. Whether used with the step sequencer or 'freestanding', Flow delivers stunning digital flanging that's at home in all kinds of electronic music. Like most Sinevibes plugins, its effortless sequencer, streamlined interface and perfectly calibrated parameters make it hard to come up with anything but usable results, and it isn't just our favourite Sinevibes plugin to date, but one of our favourite flanger plugins ever. Anyone who grew up marvelling at the flanging on those early drum 'n' bass and jungle breaks will be in heaven, as it puts the same classic effects right at the heart of your DAW and makes them easier to use than they ever were back in the day. There are certainly more organic vintage-style flangers on the market, but none of them beat Flow for sheer ease of use and effectiveness. The only thing we'd like to see improved is its host automation compatibility - only the global controls (per snapshot) and snapshot switching are available, not those of the individual steps - but that aside, at this price, Flow is a no-brainer for any Mac-based producer.